The CARB revised ILUC estimates show biodiesel is among the most sustainable fuels available and concludes biodiesel made from soy oil generates about half the indirect emissions that CARB originally outlined during its rulemaking process in 2009. Methes Energies International Ltd. announced it has received a deposit from Antilla Energy VBA, formally known as BioFuel Aruba, to start the manufacturing process of one Denami 600 to be delivered to Aruba. Delivery is anticipated for September. B20 has been used by the N.C. DOT for more than a decade and is provided at over 100 state fuel sites. The New Bern Crown Express is the third station to provide B20 to the motoring public in Raleigh, and it's the 28th across the state. ABO lauded a publication from PNNL in partnership with Sapphire Energy, "Siting Algae Cultivation Facilities for Biofuel Production in the United States: Trade-Offs between Growth Rate, Site Constructability, Water Availability, and Infrastructure." A historical look at how biodiesel production in Europe and, later, the U.S. has relied on centrifuges for a number of aspects in the biodiesel process. 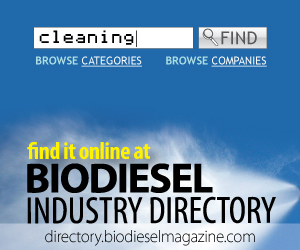 Technologies and markets have changed, but the utility of centrifuges in biodiesel has not. Lab success doesn't always translate to real-world success. A team of Michigan State University scientists, however, has invented a new technology that increases the odds of helping algae-based biofuels cross that gap and come closer to reality. To understand which form of protection, patents or trade secrets, may be more appropriate in a given situation, it is best to understand what each one is and what are its advantages and disadvantages. No form of protection is ideal in every respect. Boeing is launching a pilot program initiative with South African Airways and the Roundtable on Sustainable Biomaterials to expand opportunities for "smallhold" farmers in Southern Africa to grow crops that produce sustainable fuels. Neste Oil, one of the world's largest producers of renewable fuels, has joined forces with DONG Energy in Northern Europe to develop an integrated process to produce renewable diesel and aviation fuel based on agricultural residues.